Championship club Linlithgow Thistle booked their spot in the final of the Centenary Cup with a 3-1 triumph over Leith United. Thistle took control of the semi-final tie in an entertaining second half after a goalless opening period. Jamie Bouhaddou gave Thistle the lead in terrific fashion as he netted from fully 30 yards out for the opener, before Leith hit back straight away as they equalised from the restart through Kameil Macdonald. Thistle captain Jason Cochrane put them back in front when he converted a spot-kick before Chris Brown secured their place in the final when he headed home Lee Munro’s cross. Linlithgow will face Tollcross Thistle, Edinburgh South Vics or Murieston United in the final with the latter two still to face each other in their quarter-final tie. Westside AFC produced penalty heroics to defeat Bullfrog AFC after a 1-1 draw in their RJM Sports Sunday Trophy quarter final, winning 4-2 on spot kicks. Stand-in goalkeeper Kerr Robertson was the hero for the hosts, saving two penalties in the shoot-out to set up a semi-final clash against Lesmahagow. Westside took the tie to penalties at Saughton with almost the last kick of the game as a Bullfrog player put the ball into his own net. 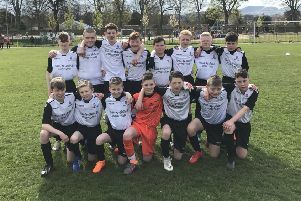 North Merchiston Vale were 6-1 winners in the quarter-final of the Rex Gallacher Cup away to Blackridge Vale of Craig. Vale braved tough conditions to produce an emphatic performance with their spot in the last four never in doubt. Craig Sloan put the visitors ahead before the break when he slotted in Paddy Kelly’s cross after Luke Leiper’s run down the left. Kelly then netted himself with a near side foot finished before he got his second of the afternoon as Blackridge’s goalkeeper let his shot slip. A quick-fire double from Ryan Stewart had Vale 5-0 ahead, only for Blackridge to pull one back from the penalty spot. Liam Henderson then make it six for Vale.